How do you intend on spending this summer? You may have holidays booked, time off to spend with the kids or you may just want to enjoy any sunshine that we get. If that’s the case, then you’ll want to know some of the best places to grab a “bite to eat”, or a “cold one”. That’s why we’ve put together a brief guide to the best rooftop restaurants to check out this summer. We’ll start with one on our own doorstep, The Varsity Club (TVC). 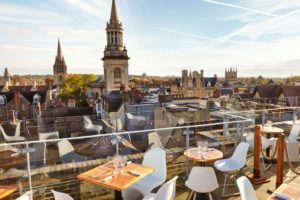 A trip to their rooftop restaurant boasts phenomenal views over the “City of Dreaming Spires” and doesn’t require you to book! If it is busy, you’ll be able to relax in their cocktail lounge until a rooftop space is available. TVC’s menu offers a small variety of main courses which include some British favourites. However, the real appeal of the menu comes from their small plates and artisan boards. Ranging from squid to chilli and lime hummus (and everything in between), ordering multiple small plates seems like a better alternative to ordering a main. In fact on a Wednesday, Thursday and Friday, you can order 3 small plates and a glass of wine for a reasonable £20. While the menu may not set you alight, it’s got a few things to tempt you and the picturesque views are worth the visit alone. If you’re looking for a rooftop restaurant with a bit of a twist then take a trip to The Boundary Project, East London. The heated glass orangery provides a comfortable and snug environment which you can enjoy all year round. It leads into the outdoor garden which features a large log burner to keep you warm as the night draws in. The summer menu offers a “slice of the medi” with delicate salads, grilled meats and French delicacies all available. Whether you’re visiting for an early lunch, a light snack or a late dinner, you’ll find something you fancy on their menu. A lot of the menu features seafood but there are a variety of options to satisfy those with an aversion to seafood. The tranquil environment of The Boundary Project makes it perfect for a late lunch or for an evening meal. A little further afield than London, The Treehouse is located in the beautiful city of Belfast. The restaurant itself is visually vibrant and they’ve created a laid back environment which is bursting with life. Perfect for those who love to socialise, this isn’t the type of restaurant you go for a quiet night out. A variety of tapas dishes are available from the main menu. You can play it safe with favourites such as breaded chicken and feta fritters or you can try something a little different in the form of popcorn scampi and crispy squid bites. The pricing is okay. It’s recommended you have 3 dishes per person (or 5 between 2) and this will set you back about £4.25 per dish. Informal dining in an urban rooftop retreat is how they describe themselves. That’s exactly what you’ll get. 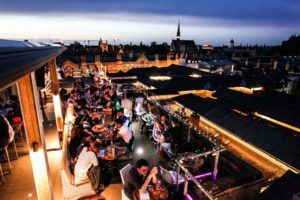 While there are many other rooftop restaurants and bars available throughout the UK, these are just three of our favourites. Make the most of the summer by checking out a rooftop restaurant. You never know, you may be dining on something we’ve helped create!